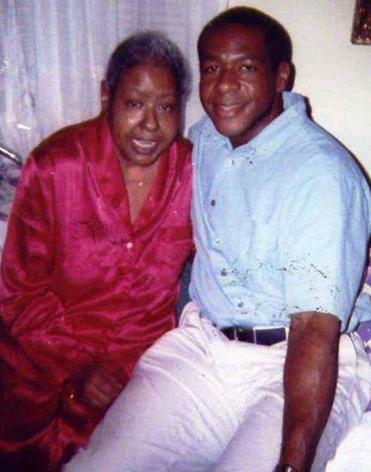 Marie Evans, who died in 2002, with her son, Willie. She received cigarette samples as a child and became addicted. The state’s highest court on Tuesday partially set aside a landmark judgment in a smoking lawsuit, unanimously ordering a retrial on $81 million in punitive damages won by the family of a Roxbury woman who died of lung cancer. In an 82-page ruling, the Supreme Judicial Court found that the Suffolk Superior Court jury deciding the case against Lorillard Tobacco Co. received inadequate instructions. The justices, however, upheld $35 million in compensatory damages awarded to the family of Marie Evans, who died in 2002. The case was the first to challenge Lorillard’s strategy a half-century ago of handing out Newport cigarettes to urban communities, including Roxbury, where menthol brands are particularly popular, and of marketing the brand as a “fun’’ cigarette to youngsters. Tobacco industry critics, while conceding that Lorillard prevailed on some claims, said the SJC’s arguments exposing the tobacco firm’s rationale behind manipulating addictive nicotine and tar levels could pave the way for additional lawsuits in Massachusetts. Justice Ralph D. Gants wrote that Lorillard essentially argued that a product with a high level of an addictive chemical cannot be deemed defective, since a product with lower levels of the chemical would not satisfy the addict’s craving and would not be purchased. Mark Gottlieb, executive director of the Public Health Advocacy Institute at the Northeastern University School of Law, said such a finding could have a far-reaching effect on future lawsuits. Marie Evans said in depositions before she died that she started receiving the cigarette samples in her Orchard Park housing development when she was just 9 years old. At first, she traded them for candy. By 13, she started smoking them, and she then developed a lifelong habit that continued until she died. On the question of marketing, the SJC found that while the plaintiffs offered evidence to show Lorillard marketed cigarettes to minors when Evans, an African-American, was a minor, they also presented evidence that the company targeted African-American adults. “The plaintiff asks us to characterize the commitments made in this advertisement as an enforceable eternal promise to the public at large to research the health effects of smoking and provide full disclosure of its research findings for all time,” Gants wrote. “We do not think a duty so broad in scope and duration can properly arise from a pledge in an advertisement” to assist a research effort. Evans’s son, Willie, who brought the lawsuit on behalf of his mother, could not be reached for comment. Lorillard has not paid out any damages. The company could be forced to pay a much higher sum with interest than the $35 million upheld Tuesday if future appeals fail. Michael Weisman, a lawyer for the Evans family, focused on the partial victory for the plaintiffs in a brief statement. In a statement, a spokesman for the North Carolina-based Lorillard praised the punitive damages section of the SJC decision. “We are gratified that today’s ruling by the Massachusetts Supreme Judicial Court ordered a new trial for punitive damages based on errors made during the Evans trial,” said spokesman Gregg Perry. Milton J. Valencia of the Globe Staff contributed to this report. Travis Andersen can be reached at tandersen@globe.com. Follow him on Twitter @TAGlobe.